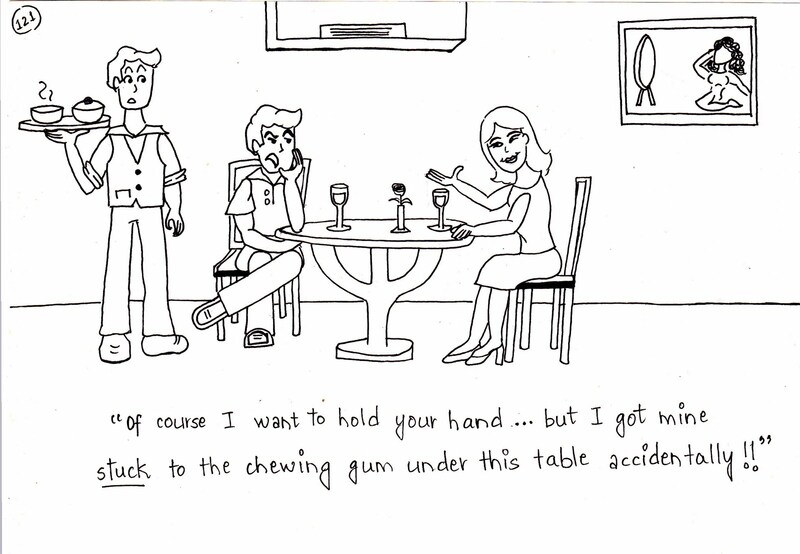 Of course I want to hold your hand... but I got mine stuck to the chewing gum under the table accidentally!! OMG, I can't believe you made this cartoon! 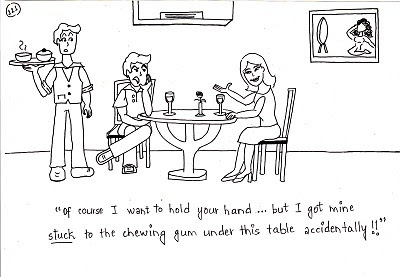 This really happened to me in a restaurant (coffee shop)! My hand got stuck to the bottom of a table in a huge wad of sticky bubble gum. It was sooo embarrasing and very distressing too as the whole ordeal lasted about 2 hours and the girl in the coffee shop got stuck too trying to help me. It was like glue! Thank you for your feedback, it feels great to know that people can relate to my p-taps. What is art but an imitation of life! I draw inspiration from my observations of daily incidents and things I see happening around me. I'm happy that you could identify with this particular joke.